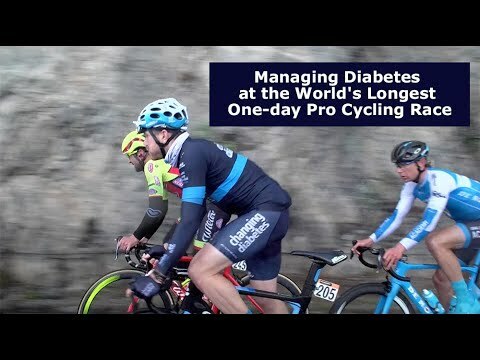 See how Team Novo Nordisk rider Charles Planet managed his type 1 diabetes over 6 hours and 250 kilometers in the breakaway at Milan-San Remo, the longest one-day professional cycling race in the world. like a wave, you know. The main challenges really are keeping glucose in the goal range. In the race, it’s always different than at home. Your body experiences a lot of different kinds of feelings. You have stress, panic. You have happy moments and sad moments. The evening before, you need to load a lot of carbohydrates – because carbohydrates mean power. At home you don’t eat much carbohydrates – because your goal is to lose weight and to not use a lot of insulin. And carbohydrates need more insulin. But before the race, of course, you need to have a lot of fuel in your body – and then just go to bed and digest and sleep. I wake up and I check my sugar, my phone. I just take it easy – put my clothes on and go to breakfast with my teammates. And just have breakfast, easy, with a nice coffee and enjoy it. I had a plate of rice and an omelette. But you really need to focus on the amount of insulin you have in the morning. The idea is to get the insulin dialed in as well as possible before the race – to minimize lows and to try to minimize highs. And then after breakfast, it’s time to be focused, little by little – when you get close to the start of the race. You just go to your room, get ready, prepare your clothes, everything – and then we leave pretty early. And then your sugar must be okay before the race. You have to eat something before the race to make sure everything is okay. But actually, personally, when I have some stress – my sugar always goes high at the beginning of the race – so I don’t have to eat anything. The most terrifying minutes… you are checking that everything is all right. You know how important it is, so you really watch the sugar level. There is a lot of nervousness, as many of the guys want to go in the breakaway. So it’s really hard. There are always many crashes. was not so good at this point. And yeah, I just had to take some insulin – and then my sugar went a bit down, and it was all okay again. I knew at this moment, if I can pass the first guy – and go full gas after this roundabout, I can win the breakaway. You make the first gap by a few meters. But you just need to keep full gas for a few kilometers – to make sure it’s the right breakaway. able to keep monitoring his glucose level. It’s just in my pocket all the time, so every five minutes, you have new data. And they can also see if it’s rising or falling – and the rate of change of their glucose. It also helps them to know what to do. They carry an insulin pen. So if they are spiking up a lot, they usually prefer to wait. Because exercise is going to reduce the glucose – but sometimes this doesn’t happen. So they might decide to inject, but this is a very rare event. For all of our riders – being skilled with that insulin management is critical. Then when you know your sugar is back in the target range – it’s just about eating constantly every half an hour.Our athletes may have to fuel a little bit more frequently. They may have to delay fueling a little bit – based on what they’re seeing on their CGM data. Even if you feel good, even if you think you eat enough – sometimes you can have a really bad day and the race is over. Drinking is super important. Sometimes it’s raining – and you don’t feel like you need to drink. But that’s the biggest mistake you can make. “It’s raining. I don’t need to drink.” But your body is losing water. Keeping glucose in range can be somewhat affected – if someone’s dehydrated. Every 15 minutes at least, you need to drink. Consuming anywhere from two to four bottles an hour might be necessary. Personally, I like to drink a lot of water – and eat something instead of drinking something – when I need to get some sugar in my body. When you get caught, you have nothing much in your legs. So you just try to find the gruppetto. You know you did your job for the day – so you just enjoy the last “easy” kilometers. After a normal race, my sugar usually goes high again. Because there’s so much stress. It’s the final of the race. So there’s a lot of stress in the peloton, a lot of panic – a lot of fight, a lot of action in the peloton. I need insulin after this stage. Otherwise I go really high. After exercise, everyone has a really heightened sensitivity to insulin. Being aware and kind of learning about how your body responds – in that post-exercise recovery period can help you learn – how much to back down on your usual dose of insulin. This is different, because of course when I do stage races – you really need to be good every day, so you just finish the stage. You think about what you eat and drink after the race. The first thing I ate was a birthday cake. So it was not…The next day I just had to go home – and not race my bike or train – so it was just a happy moment. Actually I enjoyed the whole race, but when you know…You never know, imagine you have a really bad day. You look so bad on TV. You never know. Actually I had a good day. It was cold, raining. And I showed my attitude as a fighter – as always, and I’m really proud about that.